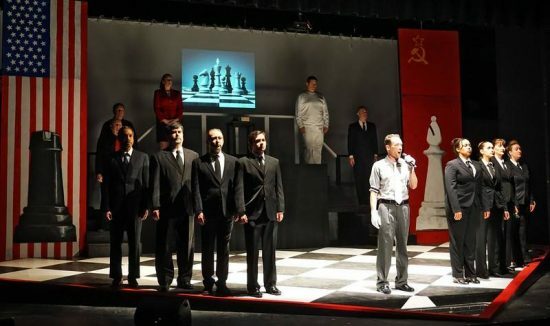 The history of “Chess the Musical” is nearly as fascinating as its subject matter of tensions during the Cold War. The West End (London) production opened in 1986 after first being released as a concept album in 1984 (apparently a popular thing to do at the time; “Evita” and “Jesus Christ Superstar” followed the same path). The British production, created by Tim Rice and ABBA duo Benny Andersson and Björn Ulvaeus, was fairly well-received and played for three years. Yet, when brought over to Broadway, the creators decided to do a total revamp, adding much more dialogue to the nearly all-music show. The result: a failure. It closed after 2 months. The productions staged these days typically revert to the London score, with a few additions such as the song “Someone Else’s Story,” which was written for the Broadway version. That’s the show being performed by 2nd Star Productions at the Bowie Playhouse through February 16. “Chess” is heavy on the symbolism, which makes for an intriguing evening. The love “square” comes into play with a second-act appearance by Sergievsky’s Russian wife, Svetlana (played by Ashley Zielinski, who absolutely kills it during her solo number, the aforementioned “Someone Else’s Story). As star-crossed lovers, Nicol and Hester also both showcase impressive vocals throughout a somewhat unwieldy score. On the production side, the set design by Gene Valendo and Mickey Lund and the costume design from Fran Marchand and Lura Myers both did their part to set the scene effectively. The bulk of the set features a slightly inclined chess board, which was put to elegant use during the chess matches as the ensemble fought a choreographed battle to depict the game (which, admittedly, was reminiscent of Wizard’s Chess from the Harry Potter movies, though much less brutal). The costumers played with shades of black, white and red for the entire cast, which ended up being a brilliant choice. At first, Florence’s bright-red blazer against Freddy’s all-white ensemble seemed like a misstep, but it ended up being an excellent symbol of foreshadowing. Running Time: 2 hours, 5 minutes, with one 15-minute intermission. “Chess” runs through February 16, 2019, at the Bowie Playhouse. For tickets and more information, click here.